This has certainly been the case in the field of exoplanet atmospheres, where the observational signals are extremely small, often measured in hundreds of parts-per-million or less. They are usually made using detectors that were never built with exoplanets in mind, and faint signals have to be sieved painfully from the fuzz of detector noise. Furthermore, sources of systematic error have been poorly understood, as one might expect in any new field. This has led to a litany of published results which have later vanished like a mirage. Debunked findings have included a variety of claimed atmospheric molecular detections. For example, transmission spectroscopy observations using the Hubble Space Telescope’s (HST) NICMOS detector were used to claim the presence of water vapor, methane, and carbon dioxide in an exoplanet’s atmosphere. As people’s understanding of NICMOS systematics improved, it became clear that the detector suffers strong systematics which can masquerade as signals. In addition, the same dataset could yield different apparent signals depending on which data reductions techniques were used. It seems unavoidable that obtaining reliable information about exoplanet atmospheres requires huge telescopes, enormous expense, and lots of manpower. With some understatement, the modeler Adam Burrows wrote in a 2014 review article that knowledge of “exoplanet atmospheres is small and by no means commensurate with the effort expended”. But exoplanet atmospheres are worth the effort, because they provide us virtually all the information about the planet other than the planet’s mass, radius, and the characteristics of its orbit. What discoveries have proven to be on firm ground? Well, for one thing, the zeroth-order conclusion that exoplanet atmospheres exist. (Checkmark.) Some of the more extended known atmospheres have had absorption lines directly characterized by HST or Spitzer, and other atmospheres have been inferred indirectly from the large apparent radii of some planets (which would have unphysical densities if planets were assumed to be solid). In fact, results from the Kepler spacecraft have led to the conclusion that planets with radii above ~1.6 Earth radii will, as a rule, have thick atmospheres. Smaller planets tend to be rocky orbs for which atmospheres are optional (like Venus vs. Mercury). 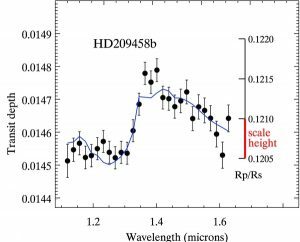 We currently know next to nothing about super-Earth atmospheres, though HST/WFC3 observations are trying to chip away at this. Important observational work on the horizon includes, among other things, measurements of atmospheric refraction of host star light. This kind of signal would be on the level of tens of parts-per-million or less, but will present a unique channel for characterizing the atmosphere of close-in planets even if they do not transit in front of the host star. If the planet does transit, then refraction can be used to identify the planets with the atmospheres which will be easiest to characterize with transmission spectroscopy (possibly Earth-sized planets! ), and for which it will be worth spending the enormously expensive telescope time to stare at it. The authors think that the “especially timely” scientific questions will involve 1.) richer characterization of atmospheric abundances, so that we can start to figure out broader relationships between planet masses and the abundances of heavy elements; and 2.) 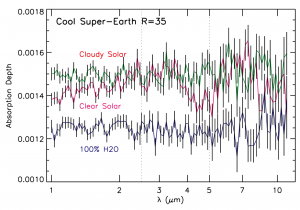 getting more data–any data!–on super-Earth atmospheres. Over the next decade, the space telescope JWST, WFIRST-AFTA, and upcoming >30 m ground-based telescopes will be at the center of the action of these science goals (Fig. 2). Further off are the massively ambitious HabEx and LUVOIR missions, whose future prospects will come more into focus after the publication of the 2020 Decadal Survey.